Spiro PID is an application that continuously monitors all control loops in your control system, prioritizes issues by improvement opportunity, and helps determine the root cause of problems. Identifying improperly tuned PID control loops and instrumentation issues is critical to optimizing plant performance. A typical process plant has thousands of PID control loops. Monitoring each PID control loop to ensure best performance is an onerous task requiring process control expertise and process knowledge. Spiro PID is a powerful application that delivers continuous measurement and visualisation of PID control loop performance, valve/actuator anomalies, and sensor performance. By understanding the cause of poorly performing control loops, users can make significant improvements to process efficiency. Table showing metric values for all PID loops being monitored. Each column can be sorted, and users can search and filter rows (e.g. filter to only show temperature loops). 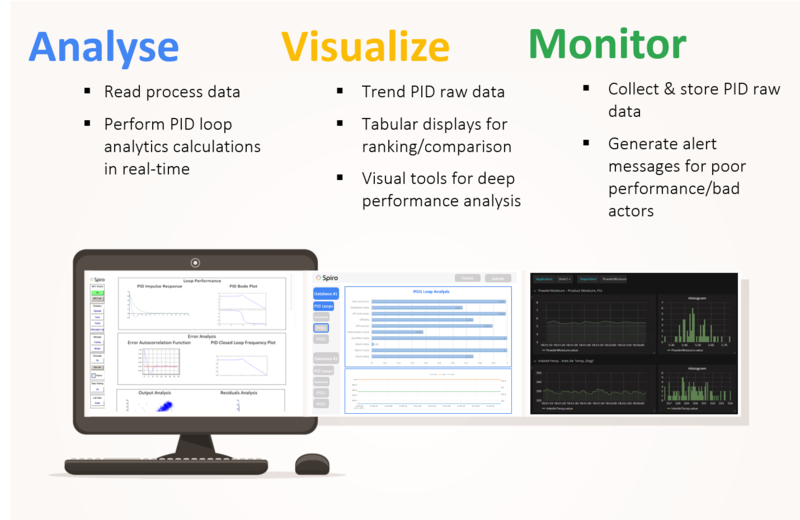 For each PID loop a user can drill down to a more detailed visual display to better understand loop performance. A set of scaled bar graphs show the real-time value of each performance metric on a range of 0-1, where values closer to 1 indicate desirable performance. Parameters can be assigned a threshold target value to be highlighted when surpassed. Plot of PID components: PV, SP, OP. Highlight data where loop is in manual or has diverged from normal mode. This can be used as a visual indication of process non-linearity, and to display control valve issues such as basklash, hysterisis, dead band, and stiction. Users are able to time shift X or Y values to account for delays. The plot provides a direct measure of how well the PID is performing in rejecting disturbances or tracking set point changes. The plot shows characteristics such as overshoot, damping ratio, settling time, and oscillations. Shows the closed loop frequency response as an alternative way to evaluate how well the PID loop is performing in rejecting disturbances or tracking SP changes. A companion plot to the ACF plot, showing the range of frequencies over which the controller is deviating significantly from minimum variance.